Since last Monday, I’ve been out of commission due to pulling my lower back while I was working out. I was in the middle of a fitness class and pushed myself a little too hard and wound up severely hurting my back. I left the gym so upset with myself for allowing that to happen and the worst part is that I didn’t even feel like going to class that day! You know those inspirational posters in gyms that say something along the lines that no one ever regrets a work out after they’re done… that’s a lie! I should have listened to my body and stayed home and went for a walk instead. Anyway, I took healing my back seriously and spent the next couple of days icing it properly and relied on Aleve to alleviate the pain. Simply walking was just about the hardest task to accomplish and every step I took was painful. BUT here I am 9 days later, and I’m just about good as new. I haven’t gone back to my normal routine of exercises, but I instead have been doing low-impact cardio (walking, elliptical, recumbent bike) and I’ve actually been enjoying the low intensity. I’m telling you guys all of this because I didn’t mean to take a week off from the blog! I attempted baking and photographing these cookies last week when I could finally walk around with less pain, but the act of hunching over to take pictures was not helping out my situation in any way. This led to all of my photos coming out subpar and there was no way I was going to post them without liking them. I waited til Monday when I was feeling much better, baked and reshot the cookies, and now I’m much happier with the outcome. Recently, it had occurred to me that I haven’t posted a “standard” chocolate chip cookie recipe yet. And I’ve given much thought as to why I haven’t done this and it could be because all of my personal favorite cookies are a step-up from the original cookie that everyone loves. Whether it’s adding toasted pistachios, or a big sprinkling of flaky sea salt, or using olive oil in place of butter, my taste for cookies aren’t what’s usually found at a local bakery. 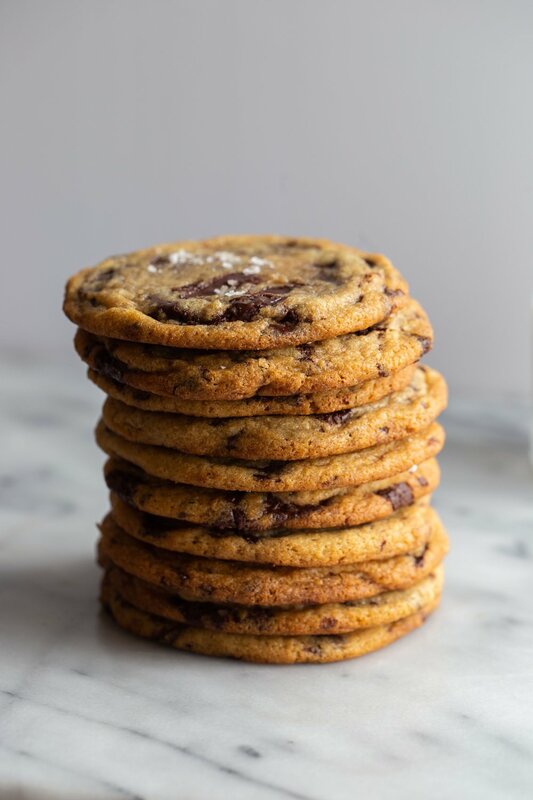 Of the six total cookie recipes that The Vivid Kitchen has to offer - including olive oil brownie cookies, toffee brown sugar cookies, and ginger molasses cookies - it apears that I’ve been focusing on giving cookie recipes that are not only amazingly delicious, but a little unique. So once again, I’m giving another cookie recipe that has one aspect to it that sets it apart from other chocolate chip cookies. This comes from the addition of tahini: a paste made from ground sesame seeds that is a staple in Middle Eastern cuisine. In America, we’re mostly accustomed to eating tahini via hummus, where tahini is a vital ingredient. Because of this, the idea of putting tahini in sweets is a bit mind-boggling to most, but tahini is actually a very popular component in an array of desserts like tarts, ice cream, and cookies. When I first tried tahini on its own, I wasn’t in love with the taste or texture and of course, this made me hesitant to add it to my cookie dough. The texture is akin to a natural nut butter in that you have to stir it well before eating it in order to incorporate the oils. As for the taste, it’s pretty unique with a roasted and bitter flavor, and just something you wouldn’t think would work well in desserts. BUT IT TOTALLY DOES. The tahini isn’t exactly prominent in the cookies but gives it a bit of a nutty flavor and even accentuates the chocolate. Seriously, these are up there as one of my favorite chocolate chip cookies. Ever. If you want your cookies to have pools of chocolate much like the ones you see in my photos, this is done by roughly chopping up bars of chocolate and then sifting the chocolate in order to discard the powder that is created from chopping. You’ll be left with a variety of chocolate chunk sizes, which is key to getting those pockets of chocolate-y goodness. And to further the savory/sweet relationship that we have going on with adding tahini to the cookie dough, finishing the baked cookies with a healthy sprinkling of flaky sea salt is a must. One last thing: I decided to make these cookies huuuuge, which is something I normally opt not to do. I wanted them to be bakery-style aka big, and in the end I was super happy with the results. If you want to make normal-sized cookies, just make sure to adjust the baking time by about 5 minutes, or keep a good eye on them around the 8 minute mark. In the bowl of a stand mixer fitted with the paddle attachment, or in a bowl large enough for a hand mixer, beat the butter, tahini and both sugars on medium speed until light and fluffy, about 2-3 minutes. Add in the egg, egg yolk, and vanilla extract. Mix until well incorporated. Scrape down the sides of the bowl. All at once, add in the flour mixture and carefully mix on low speed for about 10 seconds before turning the speed up to medium until everything is just combined. Do not over mix. Using a spatula, fold in the chocolate chunks or chips. Cover the bowl with plastic wrap and refrigerate for 12 hours. Note: if you cannot simply wait that long, wait at least 1 hour before baking off the cookies. Preheat the oven to 325°F. Line a baking tray with parchment paper, and using a spoon or an ice cream scoop, scoop out 4-5 tablespoons of dough for each cookie (about 2.5oz each). Bake 6 cookies at a time because they will spread significantly. Allow the cookies to bake for 14-15 minutes or until the cookies are golden brown on the edges and slightly pale in the center. 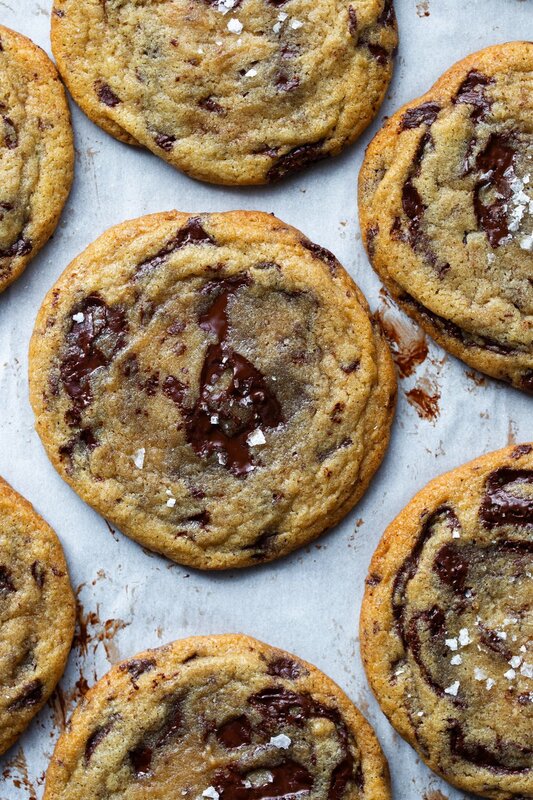 Once out of the oven, immediately sprinkle each cookie with flaky sea salt. Allow the cookies to sit on the baking sheet for 5 minutes before transferring to a cooling rack. Enjoy! Today we’re focusing on yet another cookie recipe that is a Christmas staple when it comes to treats: ginger molasses cookies. Unlike gingerbread cookies that are molded into little gingerbread men, these are shaped into a classic cookie form that yields an unbelievably soft and chewy texture as well as the signature “cracks” on top. Furthermore, the cookies are rolled in crunchy turbinado sugar (or granulated sugar if that’s all you have) before going in the oven, which leaves the cookies with a beautiful, glittery finish. All of this is ideal if you plan on having cookies on display at your holiday party or if you’re gifting cookies to friends and family this year. The name for these cookies are simply called “molasses cookies” but I upped the ginger component by adding two tablespoons of freshly grated ginger, in addition to a tablespoon of ground ginger. I really wanted to have the ginger stand out in these cookies especially since molasses is such an overpowering flavor, and so I believe the fresh ginger really adds a nice spice-y aspect. Other warm and cozy spices that are popular during this season are added as well: cinnamon, cloves, and a bit of fresh ground black pepper. Tip: The easiest way to peel a piece of ginger root is with a spoon! I learned this trick recently and wanted to pass on the knowledge. For this recipe you can use either light, dark or even blackstrap molasses, but any one you choose needs to at least be unsulphured. Blackstrap molasses is usually not suggested for desserts due to its intense and bitter flavor and thick consistency, but if that’s all you have, simply leave the salt out of the dry ingredients and it will work just like the other two. And just so you know, I used blackstrap because that’s all they had at Trader Joe’s and they came out perfectly. So just remember: if you’re using blackstrap molasses, remove the salt; otherwise, keep the salt in! I splurged on Valrhona white chocolate fèves (aka chocolate discs) from Whole Foods the other week and decided to “fancy” up these cookies by melting the chocolate and drizzling it over the cookies. 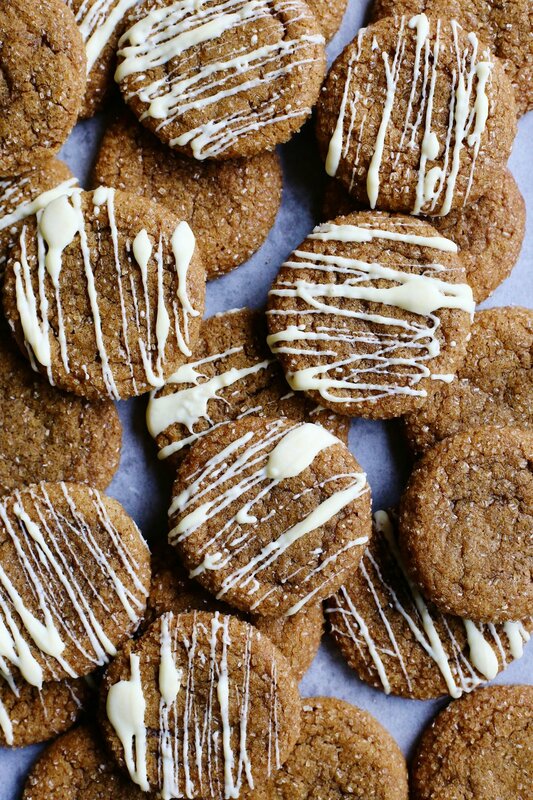 I LOVE the look of it, and if you’re worried that the white chocolate would make the cookies overly sweet, it really didn’t and actually works really well with the molasses and spices! Furthermore, it makes the cookies look prettier and more Christmas-like with the beautiful white color against the shiny turbinado sugar. It’s an optional step but worth it if you’re planning on gifting these babies or showing them off. If you don’t want to spend $$$ on the Valrhona fèves like I did, simply purchase white chocolate bars, like Ghiradelli. Using a hand mixer, or in the bowl of a stand mixer fitted with the paddle attachment, cream the butter and sugar together on medium-high speed until light and fluffy, about 2-3 minutes. Scrape down the sides of the bowl and add the egg, molasses, and fresh ginger. Mix until incorporated. In a separate large bowl, whisk together the flour, baking soda, spices, and salt. Slowly add this to the wet ingredients while the mixer is on low, and mix until just combined. Refrigerate for at least 30 minutes, so it’ll be easier to roll the dough. Preheat the oven to 350°F and line a baking sheet with parchment paper. Scoop out about 1 tbsp. of cookie dough and using your hands, roll into balls. Roll each cookie ball through turbinado or granulated sugar and place them about 2 inches apart on the prepared baking sheet. Bake for 10-12 minutes, or until golden and crackled. If for whatever reason your cookies did not crackle, give the pan a bang on the counter when you take them out of the oven. Allow the cookies to cool on the baking sheet for 5 minutes before transferring to a cooling rack. Drizzle with melted white chocolate if desired and enjoy! Now that Thanksgiving has come and gone, I am very happy to move on from the typical desserts that reign supreme for that holiday. After making pumpkin cheesecake a total of 5 times over 2 weeks, it’s safe to say that I am bidding adieu to anything pumpkin and now embracing Christmas desserts like cookies and chocolate. Even though I’m over making pumpkin cheesecakes, there’s just something so irresistible about having a chocolate cheesecake for Christmas dessert, which I’ve done for the past two years. I might give you the recipe in a few weeks if you guys want it! Let me know. To me, Christmas time is all about the cookies and every year I try to make as many varieties as I can. Plain chocolate chip, peppermint bark, rosemary shortbread, cashew butter balls… I love ‘em all. One of my favorite things to do as a gift for friends and family is to make about 4 types of cookies and stuff these cute little bags with them. It’s a great idea since it’s such an easy gift but much more personal than a gift card or bottle of wine. I totally recommend doing it, even if you just fill them with seasonal store-bought cookies. 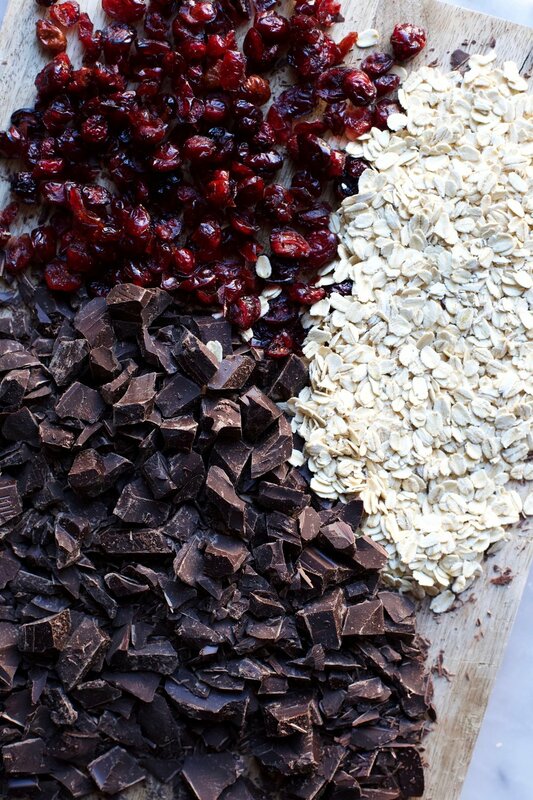 Today’s cookie recipe, Salted Oatmeal, Chocolate Chunk and Cranberry Cookies (a mouthful, I know), are sometimes part of the mix that I give out. I like that they’re a step up from a standard chocolate chip cookie because of the addition of oatmeal and cranberries, which gives them an amazing chewy texture. Furthermore, the cranberries add a nice Christmas touch with the bright red color, and you could even step it up a bit further by adding pistachios. You’re going to look at the ingredients and be like “oh dear lord… 2 sticks of butter… so much sugar… 3/4 a lb. of chocolate??!”. But don’t fret. Each batch makes A LOT of cookies - roughly 30-32, and this is all fine and well because these will all be gifted/given away or made for Christmas parties. Right?? But if that’s not the case, you can easily cut the recipe in half. There are some tricky measurements to divide by two (3/4 cup would be 6 tablespoons, for example), so here’s a nice guide to follow if you get stuck. I want to give you some advice on these cookies because something odd happened to me earlier this week when I was making them for the blog. For the first time ever, I decided that I was going to make the cookie dough ahead of time (the night before), so I could get a jumpstart on baking them the next day. When I went to bake them, they all came out of the oven burnt on the sides/bottom, yet still not baked on top. It was so weird/upsetting, and I had to throw them all away which I hate doing. After some research and double checking that my oven temperature was correct, my baking soda was fresh, and that I didn’t screw up the ingredients, I came to the conclusion that it is definitely not necessary or required to chill the dough. So, all I can suggest is either baking off the cookies immediately, OR, if you need to chill it, flatten the cookie dough mounds after you have scooped them out onto the baking sheet. This may cause the cookies to spread more, but at least it will bake evenly. Preheat the oven to 375°F and line a baking sheet with parchment paper. Using a hand mixer, or in the bowl of a stand mixer fitted with the paddle attachment, cream the butter and both sugars together on medium-high speed until light and fluffy, about 2-3 minutes. Scrape down the sides of the bowl, turn the mixer on low, and add the vanilla extract and the eggs, one at a time . Mix until combined and scrape the bowl again. In a separate medium-sized bowl, sift the flour, baking soda, and salt together. Mix in the oats. Add this mixture to the other bowl (creamed butter and sugar bowl), and mix on low until just combined. Fold in the chocolate chunks and cranberries. Using a spoon or a cookie scoop, scoop out 1-2 tablespoons of dough for each cookie and drop them onto the prepared baking sheet. Sprinkle with flaky sea salt. Bake in the oven for 10-12 minutes, until the edges are set and the cookies are nicely browned. Allow to cool on the pan for about 5 minutes before transferring to a cooling rack. Enjoy!